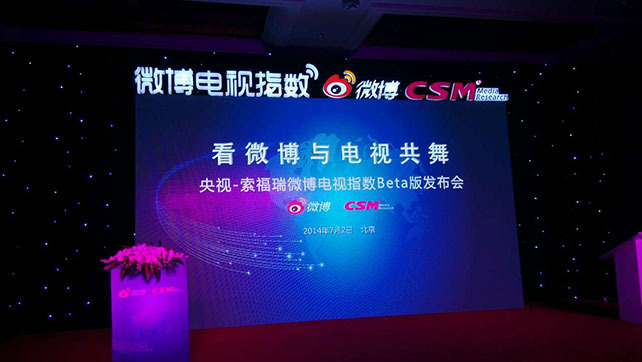 China’s newly-listed microblog service Weibo have entered a partnership with CSM Media Research, a TV & radio audience measurement institute, to collaborate on Weibo TV Measurement Index, a big data analysis system for evaluating TV program impacts based social media stats. Bringing together social TV data from Weibo with the audience research expertise of CSM, the index will calculate on how many times and how many users have mentioned a certain TV program on Weibo platform, as well as to analyze the popularity and demographic patterns of the TV shows. Weibo will start the calculation six hours before a TV show begins and the calculation will last 24 hours to avoid interference from historical data as well as to guarantee the comprehensiveness of data. The measurement will be composed of two lists for daily and weekly hottest programs. Although the index only covers popular TV shows now, the companies planned to include TV play and sports programs. Moreover, the two parties also planned to release analytic and whitepaper reports periodically based on Weibo TV measurement index. According to data from Weibo, the platform has registered over 7,000 accounts of various TV programs, most of which are for TV shows. Actually, cooperation between microblog service and audience measurement institute is not new to us. Weibo’s U.S. predecessor Twitter has announced a strategic alliance with Kantar Media to develop a new suite of tools to support planning and analytic for TV industry in 2013. Weibo and CSM Media Research will refer to the cooperation model between Twitter and Kantar, an investor of CSM Media, in terms of product system and structure, but they will also localize the pattern to adapt to Chinese market. According to data released by the two companies, around a quarter of foreign TV audience talk about TV shows on social media platforms while they are watching them. Investigation by CSM Media shows that over 50% of the audiences who once posted their views about TV shows choose to post on microblog platforms.